Lawrence County Schools has made great strides in introducing students to Career & Technical Education at an earlier age through programs such as Career Fairs, PLTW Launch, and Gateway to Technology. This year we are very excited to introduce our newest effort CTE on Wheels! CTE on Wheels is an initiative that will introduce 6th-8th grade students to more Career & Technical Education skills and exploration prior to high school when pathway decisions are so important. Career & Technical Education provides students of all ages with the academic and technical skills, knowledge and training necessary to succeed in future careers and to become lifelong learners. In total, about 12.5 million high school and college students are enrolled in CTE across the nation. Equipment such as Zspace 3D Systems, CPR Mannequins, and Robotic kits will be transported to schools within Lawrence County via the CTE on Wheels trailer and be utilized during either computer or exploratory classes for students grades 6-8. As the year progresses more equipment can be added as the interest of students is assessed through the collegefortn.org website that has been introduced to students throughout Lawrence County Schools. This week CTE on Wheels has rolled into Leoma Elementary School with lots of anxious students awaiting. The trailer serves as only the transportation piece as equipment will be housed within the exploratory classrooms inside the schools. Each high school within Lawrence County offers many CTE programs to which students may select from as their elective focus which is a graduation requirement. Before entering high school every 8th grade student and parent/guardian will meet one on one with a high school guidance counselor to determine which focus is the best fit and that decision should drive scheduling for the next four years. 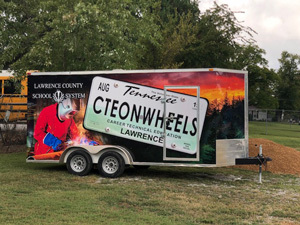 CTE on Wheels will provide students with more time and tools to explore where their interests lie so the right decision is made moving forward as a Mustang, Eagle, or Wildcat.